Dryer repair flow chart....Click here. 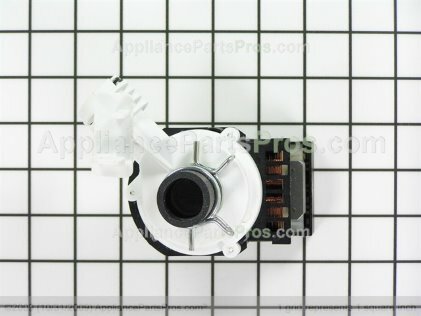 Frigidaire/White Westinghouse Rear drum bearing help - where does that little $#%%^&@ ball bearing go? 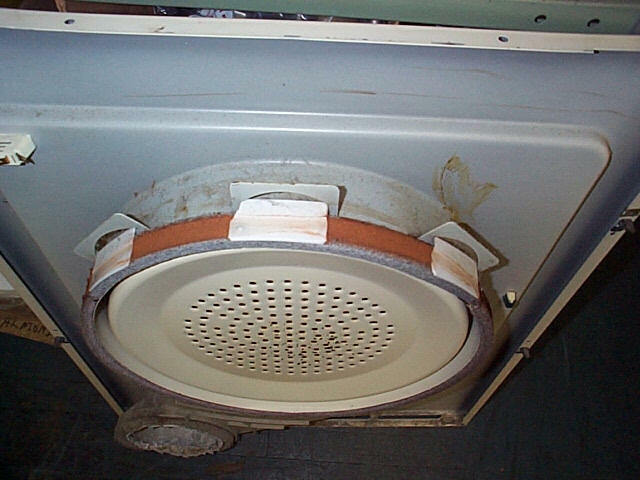 The most common area's for noise problems are the idler pulley, rear bearing and if you hear a scraping noise from the front of this dryer, take a look at the glides that the front rides on. This pictures shows the glides. Always use approved high temperature adhesive to replace the felt and glides. 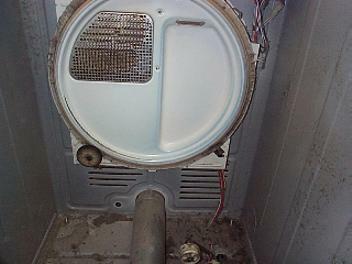 If you hear a scraping noise from the rear of this dryer, inspect the ball and socket on the rear of the drum. This area is especially susceptible to failure. See here for some how to take apart information. New section on something you should look out for when checking for a possible bad motor. Check this out. I push/turn the start button and the motor just hums: Check for something jammed in the fan blower, worn glides, worn rear drum bearing, seized idler pulley or something jamming the drum, but unfortunately 9.5 times out of 10 this is a bad motor and you will need a new one. How to take apart. 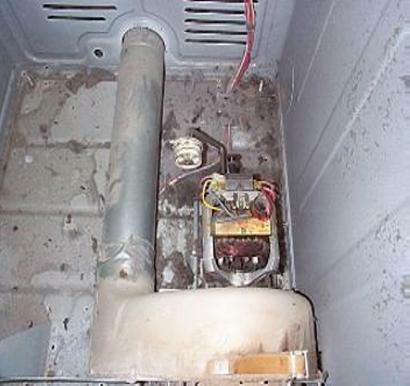 The motor shuts off before the cycle is suppose to be finished: Make sure you read up dryer vents in the basics section. Motor's also have a built in safety thermostat switch, make sure the motor is not covered with lint and that the endbells are not plugged with lint. As the motor runs it draws air across it self to keep it cool while running, these end bells must be lint free. How to take apart. A test to see if motor is any good, hook up a test cord to the motor, plug into a 120 volt outlet to see if the motor will run. If motor runs, the trouble is elsewhere, ( like a possible open door switch, timer, thermal fuse ) if the motor is still dead with direct power to it, the motor is bad. How to take apart. See "How to take apart" first. Don't forget to check fuses in house fuse box and confirm that you have 240 volts to the dryer main connection. Test for 240 volts to the heating element, 240 volts to the element and no heat = bad element. The element must be physically broken to be bad. If you have no power at the heating element, remove power, remove wires to the heating element and isolate them so that they can't touch anything. Reinstall power and check each wire for power from the wire to the dryer cabinet, one wire will probably show 120 volts and the other will show zero. Make note of the color of the wire that has no power, remove power to the dryer and check the wiring diagram to find out where that color wire goes to. Example: - wires might be black and purple, if the black wire (example only) was the one that had no power, look at the wiring diagram to find out where that goes to and check only those parts, no need to check the other colored wire parts as they are working. If live volt testing scares you, try the ohm check instead. Blowers become stripped out and loose from the motor shaft. This is a source of a rubbing noise in these dryers. 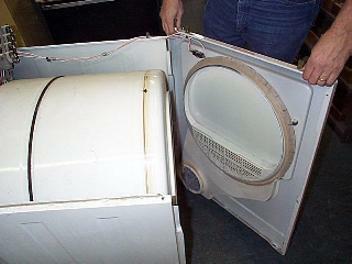 In addition to checking the blower, check the door seal, the drum seals and the lint screen. We are seeing lint screens completely clogged with fabric softener and detergents. Check it with water. If water don't run thru the filter, it is stopped up. If the air flow through the dryer is sufficient, then the next step is to carefully inspect the vent the whole length of it. Improper venting is a large part of dryer repairs. 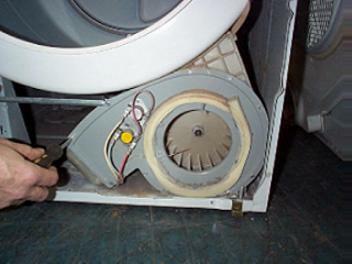 You must check to see if the vent hose is crimped behind the dryer when the dryer is pushed back against it. Lint will accumulate in long runs and must be cleaned out. Best money maker in the world for service people is the white vinyl vent material. In addition to being very apt to cause problems, this stuff is a fire hazard. If you see that your vent is this vinyl, change it all out to a good super flex vent or all metal. It has been my observation over the years that venting problems cause a whole lot of the other problems we see on dryers. Motor run is the second problem you can encounter. 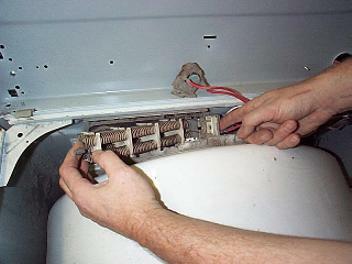 If the motor on a dryer will not run, these are the places to check. Power supply, timer contact for motor run. Door switch. Thermal fuse. Start switch. Motor and related wiring. No heat or low heat is the third problem and probably the most common problem with dryers. The places to check for this problem on an electric dryer are: Power supply-Heater element-thermal fuse-heat select switch-timer contacts for heat circuit-high limit and control thermostats, and the motor run safety switch. These tests can be made with an ohm meter with the dryer unplugged. Or they can be made with a volt meter live. No heat or low heat is the third problem and probably the most common problem with dryers. 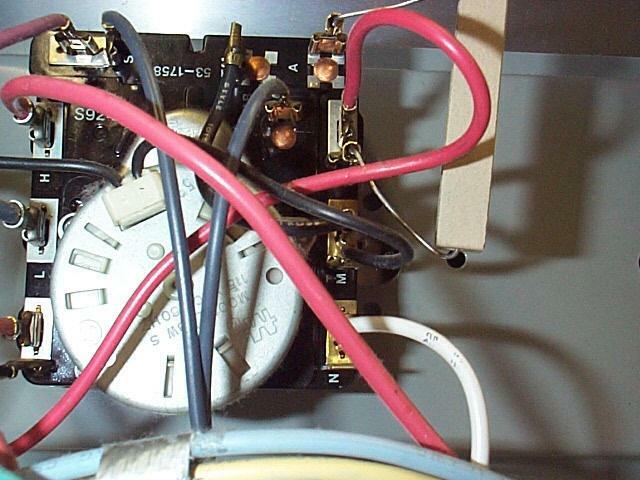 The places to check for this problem on an electric dryer are: Power supply-Heater element-thermal fuse-heat select switch-timer contacts for heat circuit-high limit and control thermostats, and the motor run safety switch. These tests can be made with an ohm meter with the dryer unplugged. Or they can be made with a volt meter live. Checking for no heat on a gas dryer is a little different than on the electric dryer. The first thing to do is determine if you have voltage coming from the controls. If you have voltage coming from the controls to the burner assembly, then you must check the igniter, coils on the gas valve, sensor, and then the gas valve itself. If you do not have voltage coming to the burner assembly, then you will check the timer contacts, heat select switch, high limit thermostat, control thermostats, thermal fuse, and motor safety switch. Gain access to the controls on the console by removing the back cover, remove the knobs on the timer and selector switch by pulling off. Remove the face plate from the panel with a few screws. You are now where you can service the heat selector switch and the timer. The heat circuit in the timer is contacts H to L. The motor run circuit in the timer is L to M. That is on this particular dryer. While most brands of dryers keep the same placement of circuits throughout the lineup of dryers, it is always best to look at the wiring picture for your particular dryer if possible to get circuits to test. Circuits in the selector switch: Fluff-no circuit made. Regular heat L1 to C. Low heat L1 to 1. Remember, always remove the wires from the terminals being tested. 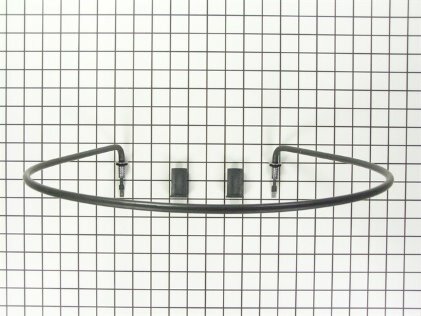 Remember that the contacts I have listed here are for the dryer I am picturing. 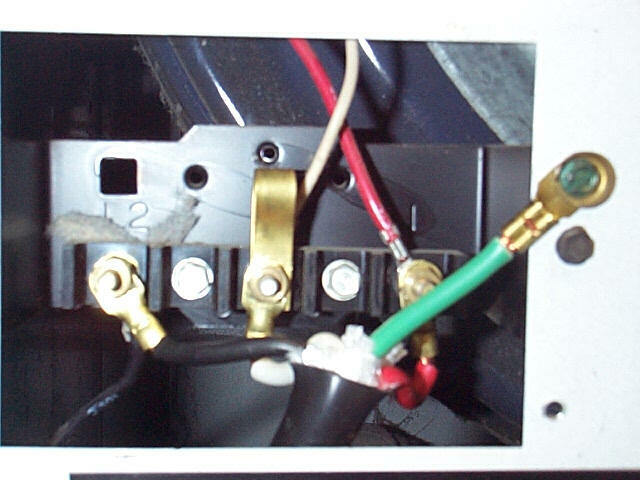 Use the wiring picture for your dryer to get the proper contacts to test. They may or may not be the same as those in this tutorial. Get the top up on the dryer. Service the heater, high limit, and thermal fuse from here with the top up. Check the heater, high limit thermostat, and the thermal fuse with an ohm meter. All should show continuity. Remember to always remove the wires from the part you are checking with an ohm meter. Next picture is the heater. It is located on the left rear of the drum in a housing. The thermal fuse and the high limit thermostat are also located here. The thermal fuse on this dryer shuts the motor down when it is blown. Taking the front loose to remove from dryer. So you can service the door switch from here. There are 2 screws inside at the top to get the front loose after getting the top up. Pull the top of the front forward and lift it off the clips it sits on. The contacts in the door switch are C to NC with the door open, and C to NO with the door closed. Continue to remove the front. 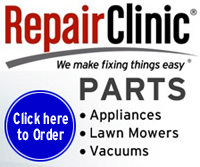 After you have removed the front, you can service the door switch, the filter housing, and the front drum seal. From here you can service the cycling thermostats. Check them for continuity with an ohm meter. This pictured dryer has 2 heat thermostats and will have a heat selector switch on the control console. The selector switch on fluff setting makes no heater contacts. Selector set on regular heat makes circuit from L1 to C. This will select the bottom L146 thermostat as pictured. Setting the switch on low heat will select the L120 [ this means a limit thermostat and will open the circuit when the temperature reaches 120 degrees] top thermostat as pictured. The circuit in the switch is from L1 to 1 for low heat. You can remove the cover plate from the blower housing and replace the blower on the motor shaft. This is a common repair on this dryer. To change the belt, go through openings on left and right. Feel the belt and remember how the spring loaded idler pulley places pressure on the far back side of the belt. 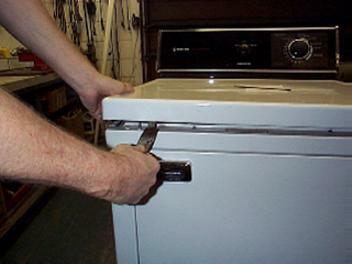 With the left hand, push pulley to right to remove pressure from the belt. Take the belt from the motor pulley with the right hand. Put the new belt around the drum with the grooves of the belt on the drum. Put the belt on the motor pulley and place the idler back so that it exerts pressure on the belt. To remove the drum from here, take the belt loose from the idler pulley and lift the drum off the 2 rollers on the rear bulkhead. It will just lift out of the dryer. With the drum out, you can service the motor, idler pulley, safety thermostat, rear drum rollers, and the front glides that the front of the drum rides on. Roller help - To assure trouble free operation, it is recommended that you install both cylinder rollers in the LA-1008 kit at the same time. 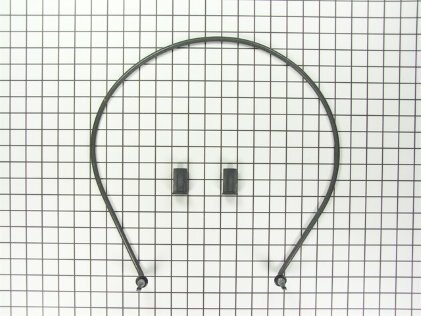 The two spacers included in this kit are to be used on the right rear support assembly, as illustrated. The left rear support does not require any spacers. From here you can check the motor, the idler pulley, and the glides that the front of the drum rides on. If you wish to check the windings in the motor, you will need to remove the 3 wires going into the motor from the external motor switch. Draw yourself a wiring picture of how the motor is wired. You should read continuity across all 3 wires in the motor. The motor safety switch is contacts 3 & 4 on this dryer. Magic Chef-Crosley-Norge-Admiral Dryers. - Some sample parts breakdowns are here and here.